PXI Switching, High Current Relay Card - GX6315 Series | Marvin Test Solutions, Inc. 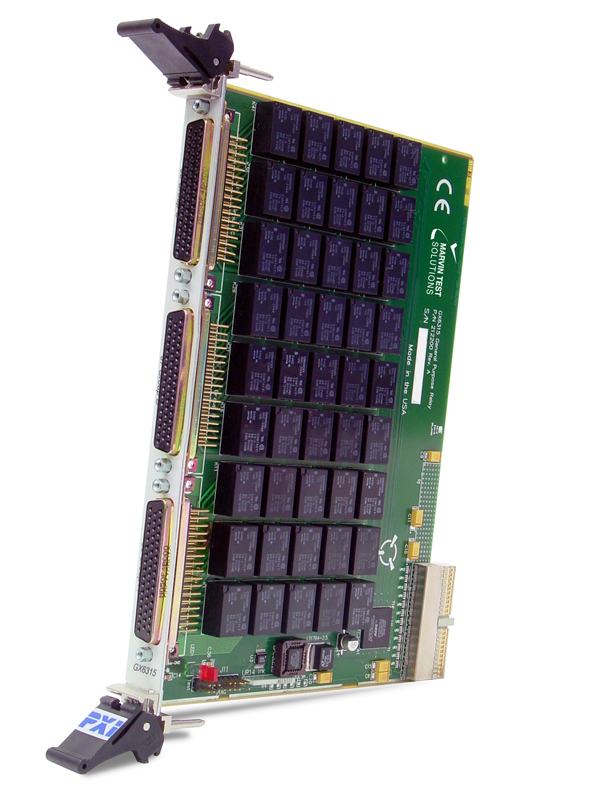 The GX6315 is a 45 channel, high current relay board that plugs directly into any 6U PXI slot. The GX6315 also provides nine transistor-driven channels for external relays. These outputs may be used to drive external loads, such as heavy duty relays, lamps or other devices. The GX6315 consists of three groups: A, B, and C. Each group has 15 high current relays, three open collector relay drivers, and a 50-pin D type connector. The three open collector drivers in each group are connected via diodes to the same fly-back signal. The fly-back signal can be connected to the external relay supply to provide suppression for voltage spikes generated by the relays’ coils. Connections 50-pin D Sub-type connectors. Includes three mating connectors.